Highway 60 that takes you through Algonquin Provincial Park in Ontario, Canada is stunning during the Fall season when all the colours of trees change. Driving along Highway 60 in the Fall, the road is fairly quiet which gives tourists to Algonquin Provincial Park in Ontario, Canada plenty of time to stop and enjoy the colours of the forest. The colours extend all the way to the crest of the hillsides and continue on over the top creating a magical scenic picture. Shades of fall along Highway 60 through Algonquin Provincial Park, Ontario, Canada. 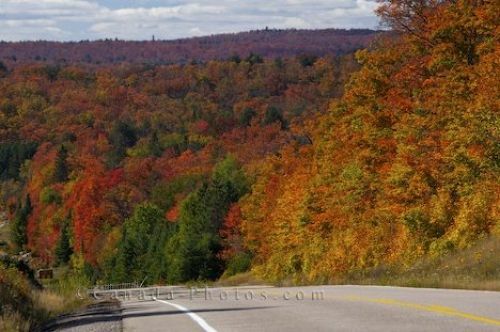 Picture of Highway 60 through Algonquin Provincial Park in Ontario displaying an array of colours during the Fall season.